Sanshou (散手; sǎnshǒu; literally "free hand") or Sanda (散打; sǎndǎ; literally "free fighting") is a Chinese hand to hand combat, self-defence system, and combat sport. Not seen as a style itself, but is rather considered as just one of the two components (taolu and sanshou) of Chinese martial arts training and is often taught alongside with taolu training. It may simply be seen as the practice of martial applications in a realistic environment or simply free fighting. However at the same time the modern standard taolu curriculum was created by the Chinese government. They created and formalised a standard curriculum for sanshou as well. This curriculum was developed by experimenting with the Chinese military experiences in close range and hand to hand combat with reference to traditional Chinese martial arts. Chinese martial arts masters that were still in China (prior to the abolishment of traditional martial arts during the Cultural Revolution) gathered to contribute the creation of the standard curriculum. This general sanshou curriculum varied in its different forms, as the Chinese government developed a watered down version for civilians for self defense and as a sport. However in traditional wushu circles the practise of sanshou may vary and is practiced in relation to their taolu. Later the official name reverted back to Sanda. The term Sanda has a longer history and is more commonly used. The generalized modern curriculum practised in modern wushu schools is composed of different traditional martial arts fighting styles in China, but mainly based on scientific efficiency. Sanshou is composed of Chinese martial arts applications including most aspects of combat including striking and grappling, however when sanshou/da was developed as a sport, restrictions were made for safety reasons as well as to promote it as a non violent sport. Examples of such restrictions included no blows delivered to the back of the head, spine or groin and the discontinuation of the combat when any of the fighters fall to the ground. However many schools whether traditional or modern, or that practise sanda for competing or not, practise it as an all round martial arts systems with no restrictions, only adapting their training in relation to competition rules prior to the event. Teaching and practicing techniques to restrain, maim, injure or kill an opponent or opponents. Sanda tournaments are one of the two wushu sports disciplines recognized by the International Wushu Federation. Sanshou's competitive history involved barehanded or Lei Tai fights in which no rules existed. However, even sanshou as a competitive event developed in the military as these bouts were commonly held between the soldiers to test and practice barehanded martial skills, ability and techniques. Rules were developed and the use of protective gloves etc. was adopted. It was originally used by the Kuomintang at the first modern military academy in Whampoa in the 1920s. Later it was also adopted as a method by the People’s Liberation Army of China. One can see general sanshou as a synthesis of traditional Chinese kungfu fighting techniques into a more amorphous system and is commonly taught alongside traditional Chinese styles which Sanshou techniques, theory and training methods are derived from. The emphasis of Sanshou is on realistic fighting ability. As an unarmed self-defense, close combat system, Sanshou includes ti(kicks), da(punches), shuai(Shuai Jiao), and na (Chin Na). Sanda as a sport has a very great emphasis on throws. One of its most distinguished techniques is the "kick catch". This is when one person kicks and the person performing the throw catches the kick and then trips the person kicking when he's on one leg. 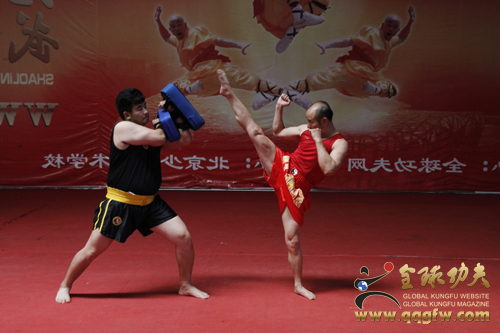 As a sport, Sanshou/Sanda is practiced in tournaments and is normally held alongside taolu events in wushu competition. For safety reasons, some techniques from the self-defense form such as elbow strikes, chokes, and joint locks, are not allowed during tournaments. Furthermore, when competition is held on a raised lei tai platform it is possible to defeat the opponent by moving (whether by throwing, striking, or otherwise pushing) him out of the competition area. Fighters are only allowed to clinch for a few seconds. If the clinch is not broken by the fighters, and if neither succeeds in throwing his opponent within the time limit, the referee will break the clinch. In the US, competitions are held either in boxing rings or on the raised lei tai platform. Amateur fighters wear protective gear. "Amateur Sanshou" allows kicks, punches and throws. If the rule set is referred to as "Sanda", knees to the body are also permitted. A competition held in China, called the "King of Sanda", is held in a ring similar to a boxing ring in design but larger in dimension. As professionals, they wear no protective gear except for gloves, cup, and mouthpeice, and are allowed to use knee strikes (including to the head) as well as kicking, punching and throwing.